Not so long ago we didn’t have a clue about what was good or bad for us when it came to school dinners. Rather than the nutritious canteen offerings of today, the teens of yesteryear were served up plastic cartons of cheesy chips and gravy; slathered in tomato sauce. Our growing arteries may have been too clogged with grease for us to show any sporting abilities, but by God it made a satisfying meal after a gruesome helping of double maths. Now, pizza proprietors Domino’s have decided to make all 2000’s era teen’s culinary dreams come true with their brand new Domino’s Chips Cheese and Gravy. 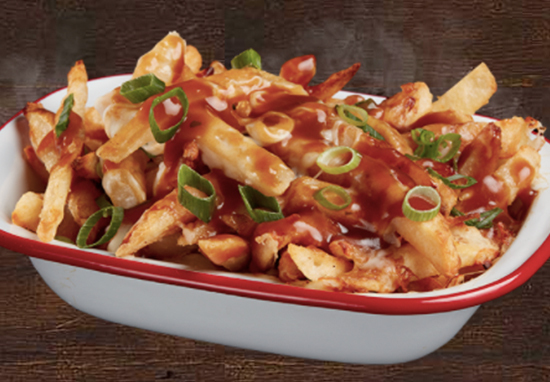 Chunky cut chips topped with a rich, traditional gravy, melted mozzarella cheese and fresh spring onion. Now – as any true takeaway connoisseur will know – Domino’s gravy is actually quite decent; perhaps even rivalling the mighty KFC. However, it’s still a relatively underrated item on the menu; long overshadowed by stuffed crusts and chicken wings. Could now be the moment moment to shine like the greasy goddess it’s always been? Although this is – as of yet – only available in Australia, Brits are praying it makes an emergence to Domino’s stores closer to home. After all, this would be ideal comfort grub to wait out Storm Emma with. Why have I been constantly craving cheese chips and gravy since I had some Wednesday night ? Pure craving chips cheese and gravy? just wanna eat chips cheese and gravy all day every day ? They’ve conquered the world of pizza. Can they now stick their flag firmly in the relatively unknown planet of Chips, Cheese ad Gravy?